“A Quest for Kairos” from Christian Faith Publishing author Nate Kibler is an illuminating narrative about Kibler and his wife’s infertility issues. The book highlights the pain that millions of people battle with and addresses in a raw manner the reality of infertility, how common, and how painful it is. “A Quest for Kairos: An Infertility Journey on God's Time”: an emotional, genuine story brings forth a problem that countless couples face in secrecy every day. “A Quest for Kairos” is the creation of published author, Nate Kibler who graduated in 2004 with a degree in business management. Kibler is a successful entrepreneur and owns an award-winning business in Charlottesville. Published by Christian Faith Publishing, Nate Kibler’s new book is eye-opening and gritty narration of the Kibler’s personal fight with the taboo topic of infertility. Kibler pushes for a more open dialogue concerning infertility in the book – in efforts to make the couples enduring this difficulty to feel less displaced than they already do. “A Quest for Kairos: An Infertility Journey on God's Time” is an emotive true story that brings to the forefront a common problem that is seldom discussed. Enlightening and thoughtful, this is a great read for anyone concerned compassion for others. View a synopsis of “A Quest for Kairos” on YouTube. Consumers can purchase “A Quest for Kairos: An Infertility Journey on God's Time” at traditional brick & mortar bookstores, or online at Amazon.com, Apple iTunes store, Kobo or Barnes and Noble. 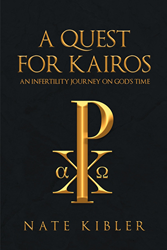 For additional information or inquiries about “A Quest for Kairos: An Infertility Journey on God's Time”, contact the Christian Faith Publishing media department at 866-554-0919.